Can anyone come to the temple? We welcome all people, regardless of ethnicity, age, sexual orientation, and political or religious affiliation. Is the Sunday service open to the public? Yes, it is open to everyone who is interested. Most temple events are open to the public as well. Sunday services are composed of two different parts, and the vast majority of people stay for both of them. During the school year, the first part of our service is for the Dharma School students. We have chanting, sing a gātha [Buddhist hymn] and hear a Dharma message from our minister. The students are then dismissed to their classes and the adult portion of our service begins, following the same format as the children’s service. All together, service usually lasts about one and a half hours. During the summer, there are no Dharma School services. Yes, although our chants and some of the songs are in Japanese, everything is written phonetically. We do have a Japanese dharma message once a month after regular service. No, there is no dress-code and you do not need to prepare anything in advance. We sit in pews, and we do not remove our shoes when you enter the temple. Yes, children are welcome. During the school year, we have Dharma School (Buddhist Sunday school for children), which happens after the Dharma School Service on Sunday mornings. There, students learn more about Buddhist teachings and Japanese culture. Dharma School is divided into several classes based on children’s grades in school. We do, but formal, seated meditation is not the main practice of our tradition. For us, meditation simply means to be mindful. During service, we do have a short period of meditation, but our main form of meditation is to practice awareness and self-reflection in our daily lives. No, “Buddha” means “one who is awakened to the truth.” Our goal as Buddhists is to become a buddha. The historical Buddha, Shākyamuni Buddha, or Siddhārtha Gautama was a man who lived in northern India about 2,600 years ago. At 29 years of age, he left home to try and understand meaning and suffering of life. When he awakened to the realities of suffering and how to relieve suffering, he became a buddha and spent the rest of his life teaching others. Buddhists also recognize the existence of many other buddhas. In our tradition, we venerate Amida Buddha as an approachable, concrete embodiment of truth, which has no form or color by itself. 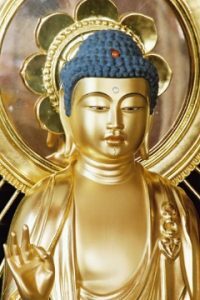 What is Jodo Shinshu Buddhism? Jodo Shinshu, also known as Shin Buddhism, was founded in Japan by Shinran Shōnin (1173 – 1263 CE). Headquartered in Kyoto, Japan, Shin Buddhism is the largest Buddhist sect in Japan, and one of the largest in the U.S. Our sect is non-monastic and our practice is meant for the average person. What is the phrase I hear you repeat at different times during the service? This iscalled the “Nembutsu” This is the phrase “Namo Amida Butsu,” which is the primal expression of a Shin Buddhist’s gratitude to Amida Buddha for the boundless wisdom and compassion that has been given to us. The phrase basically means, “I gratefully entrust myself to Amida Buddha.” At Sunday service, and throughout the life of a Shin Buddhist, the recitation and coming to a realization of the true meaning of “Namo Amida Butsu” is just as important as breathing or the continuing flow of blood throughout one’s body. During our services, we recite the Nembutsu many times. There are different ways to recite it, and you will hear all of them during a typical service. These include, “Namu Amida Butsu,” “Na Man Da Butsu,” and “Na Man Da.” They all mean the same thing. How does a person become a Shin Buddhist? Anyone can become a member of our Shin Buddhist sangha (a word for the Buddhist community). There are no restrictions or social barriers prohibiting a person from becoming a follower of the Nembutsu Path. I see some people holding strings of beads during the service. What is the significance of these? This is a Buddhist rosary, which in our tradition we call “nenju.” “Nen” means “mindful/thinking,” and “ju” means beads, thus these are beads we use to keep us mindful of the Buddha. Different denominations of Buddhism use nenju of different styles. In our tradition, we do not use the beads to count prayers or recitations of the Nembutsu, and the number of beads in the nenju is not important for us. In the past, a traditional Buddhist nenju had 108 beads, but today most lay members use a shorter version with fewer beads for easier carrying. We carry our nenju in our left hands, but if a person has no left arm or hand, or if the hand or arm is broken and cannot carry anything, it is perfectly acceptable to wear or carry the nenju on the right hand. Yes, there is free, street parking around the temple. How do we give donations at the temple? It is not required, but if you wish to give a donation, there is a donation basket at the front of the service hall where you can place a donation. Or, you can ask one of the greeters for a donation envelope that you can use and give back to them. Is the temple ADA accessible? Currently, we have an “evacuation chair” that we use to help people up the front stairs. We have an ADA compliant bathroom on the main floor. Keown, Damien. Buddhism: A Very Short Introduction. Oxford: Oxford University press, 1996. Khyentse, Dzongsar Jamyang. What Makes You Not a Buddhist. Boston: Shambhala, 2007. Tanaka, Kenneth K. Ocean: An Introduction to Jodo-Shinshu Buddhism in America. Berkeley: WisdomOcean, 1997. Unno, Taitetsu. River of Fire, River of Water: An Introduction to the Pure Land Tradition of Shin Buddhism. New York: Doubleday, 1998. The Tacoma Buddhist Temple belongs to the Jodo Shinshu Nishi Hongwanji tradition of Buddhism. 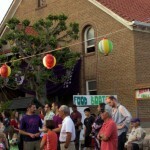 Our national organization is the Buddhist Churches of America, headquartered in San Francisco, California.